Building a picture of the wellbeing of residents in South Gloucestershire. Our JSNA document provides a comprehensive picture of the current and future health and wellbeing of our local population. 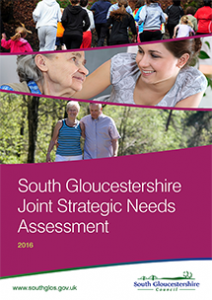 It is used by health, social care and voluntary organisations as an evidence base for planning services to meet the needs of the local population and the priorities identified from the JSNA will be used to inform the next Joint Health and Wellbeing Strategy.